Poster Design of the Year! Here at Positive Media, we get to see hundreds of posters every year and there are some that are truly outstanding! 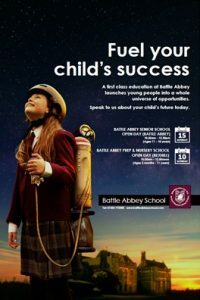 This year this fantastic poster from Battle School really packed a punch! It has great impact and a clear message and captures your imagination! This poster has been displayed in The Priory Hastings and also Bannatyne Hastings and it has received a great response. "The process was smooth and simple and the after care service was excellent. It was lovely to see a pic of the sites by way of a follow up, so few agencies do this and it helps sell the channel internally at board level. The sites represent a departure in terms of demographic for us but I'm sure will become a key component in reaching our central Hastings catchment area. I couldn't be happier. I'm planning to keep this as a regular component of our bi-yearly campaigns from now on."